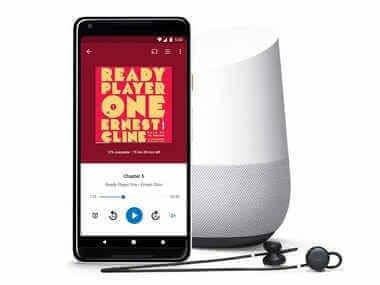 Google has launched an audiobooks section on the Google Play Store in India and 45 other countries. Audiobooks are available to buy in nine languages and there is also an Assistant integration. So you can fire up Google Assistant to listen to an audiobook that you may have bought. The audiobooks can be heard through the ‘Ready Player One’ on the Google Play Books app which will be launching shortly on the Play Store. Users can listen to the preview of a book before buying it on the Play store. Google Assistant can also be commanded to read the books after 20 minutes or allows to schedule it for bedtime reading. The voice-assistant will start reading the book from wherever you last heard it, on any of your devices. Audiobooks of various genres including Jhumpa Lahiri’s ‘Unaccustomed Earth’, ‘Astrophysics For People In A Hurry’ by Neil DeGrasse Tyson and Chetan Bhagat’s ‘One Night At The Call Center’ are available on the Indian Google Play store. This move should hopefully help get Amazon to launch its own audiobooks platform, Audible, in India. Audible is one of the most popular audiobooks platforms, but you need to subscribe to it to listen to audiobooks. With the Google Play Books app, you will not need any subscription. With the Echo range of devices already launched in India, it is a matter of time before Audible is also announced here. Till then, you can listen to your Kindle books on your Echo devices.